From Search and Rescue Vehicles, to Farmers’ Markets, to Low-Income Housing and more! 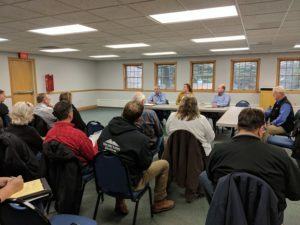 Twelve area banks and local government officials from around Cheboygan County and Onaway met to learn more about various USDA loan and grant programs that could immediately impact potential homeowners and township infrastructure needs at the Cheboygan County Lenders Forum hosted by NLEA in Indian River at the Tuscarora Township Hall on November 7, 2018. Potential projects such as a Mullett Township marine patrol & rescue boat, to a Tuscarora Township Farmers’ market site improvement projects were identified with the corresponding USDA loan or grant program that would apply. Business & Industry – Guaranteed commercial loans in partnership with local lenders, and Renewable Energy/Energy Efficiency Grants available to rural businesses. USDA Rural Development is the only agency that can build a community from the ground up. The NLEA wants to make sure our rural municipalities, businesses and residents know what Rural Development programs are available in their communities. More information including a PDF of all USDA Programs available, eligibility criteria, and contact info can be sent by contacting: buck@northernlakes.net.